What’s hot on the West Coast? The desert of course! With popular hot spots in sunny Scottsdale and Phoenix, Arizona. There’s so much to see and do from A-to-Z in AZ! Trending now… JUICING! 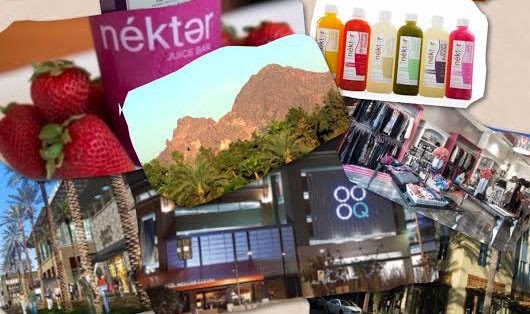 Nekter is the newest juice bar to hit Scottsdale, and the possibilities are endless. Nekter allows you to pick any fruit you like and make it into a juice or smoothie. Or choose from their great menu of yummy combinations. Try the Pink Flamingo, not only because of its fruitful taste but its unique dragon fruit, something that you’ll be glad you tried. Nekter also allows you to do a cleanse of 1, 2, or 3 days which cleanses your body while getting all of the nutrients you can possibly need at a perfect price! Once refreshed by juicing it’s time for some shopping! Scottsdale is known for its wide variety of outdoor malls. Two must-sees are Kierland Commons and The Scottsdale Quarter. They both have different stores so they complement each with a walkway from one to the other that makes it convenient for everyone. The restaurant choices are endless. One store in the quarter that is a must see is Elan Style, a stylish boutique with over 50 brand names of clothing. You can literally find everything there from a pair of jeans to a beautiful cocktail dress. They have accessories galore to go with any and everything. Elan Style is also a great spot to find light weight spring and summer maxi dresses. It’s a gold mine for finds so make sure to check it out when you’re in the Mall! 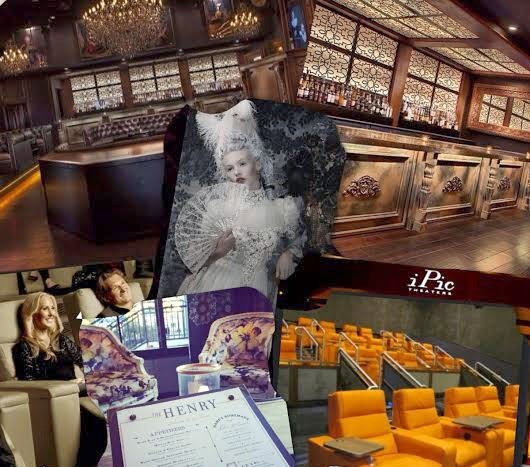 One main point of attraction in the Scottsdale Quarter is the iPic Theater. The iPic Theater has seating in luxurious leather couch chairs, with a special section that reclines! In the recline section you get free popcorn, and they offer a pillow and a blanket, a full menu from appetizers to desserts, and a full-service bar menu as well. The theater is beautiful with a full bar in the main lobby for people to meet and enjoy a drink before the show. It’s so convenient: two outside shopping malls, with restaurants, and a movie theater! Now the night life … Old Town Scottsdale is a must see. Nightlife in Scottsdale, Arizona is endless but the newest hot spot is a must – a nightclub called Cake. It’s a French chateau theme with performers that entertain through the night, including acrobats, Marie Antoinette characters, and fire eaters. In Phoenix, AZ, you have to visit the new Fox Restaurant Concept called The Henry. The food is on point, and they serve breakfast, lunch, and dinner. You can even grab a coffee with friends at their coffee bar where they offer sweets to fulfill that sweet tooth. They don’t take reservations; however, it is worth the wait so try to get there a little earlier than you plan on eating. This place is on the radar as a new hot spot, and everyone wants to dine at this amazing eatery. The ambiance is great with both inside and outside seating which is the best of both worlds. After so much indulgence in shopping, restaurants and night clubs the perfect balance is a visit to Camelback Mountain in Phoenix, AZ, so named because the mountain really does look like a camel; it has a newly paved trail that offers an amazing hike to the top. The effort is so worth the workout and the experience. The top is a beautiful area surrounding and overlooking the valley with breathtaking views. It is a real treat especially for hikers and those who love to workout. So open your senses to the endless options a visit to the desert offers. www.elleauri.com has the perfect fashions for your next desert area excursion.